For related races, see 1952 United States elections. Incumbent Democratic President Harry S. Truman had remained silent about whether he would seek another full term, but the unpopular incumbent announced his withdrawal from the race following his defeat in the New Hampshire primary by Tennessee Senator Estes Kefauver. After Truman's withdrawal, the president and other party leaders threw their support behind Stevenson, the moderate Governor of Illinois. 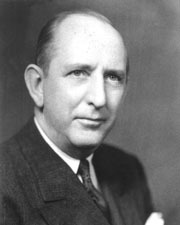 Stevenson emerged victorious on the third presidential ballot of the 1952 Democratic National Convention, defeating Kefauver, Senator Richard Russell Jr. of Georgia, and other candidates. The Republican nomination was primarily contested by conservative Senator Robert A. Taft of Ohio and Eisenhower, a general who was widely popular for his leadership in World War II. With the support of Thomas E. Dewey and other party leaders, Eisenhower narrowly prevailed over Taft at the 1952 Republican National Convention. The Republicans chose Richard Nixon, a young anti-Communist Senator from California, as Eisenhower's running mate. Republicans attacked Truman's handling of the Korean War and the broader Cold War, and alleged that Soviet spies had infiltrated the U.S. government. Democrats faulted Eisenhower for failing to condemn Republican Senator Joe McCarthy and other anti-Communist Republicans who they alleged had engaged in reckless and unwarranted attacks. Stevenson tried to separate himself from the unpopular Truman administration, instead campaigning on the popularity of the New Deal and lingering fears of another Great Depression under a Republican administration. Eisenhower retained his enormous popularity from the war, as seen in his campaign slogan, "I Like Ike." Eisenhower's popularity and Truman's unpopularity led to a Republican victory, and Eisenhower won 55% of the popular vote. He carried every state outside of the South and won several Southern states that had almost always voted for Democrats since the end of Reconstruction. Republicans also won control of both houses of Congress. The moderate Eastern Republicans were led by New York Governor Thomas E. Dewey, the party's presidential nominee in 1944 and 1948. The moderates tended to be interventionists, who felt that America needed to fight the Cold War overseas and confront the Soviet Union in Eurasia; they were also willing to accept most aspects of the social welfare state created by the New Deal in the 1930s. The moderates were also concerned with ending the Republicans' losing streak in presidential elections; they felt that the personally popular Eisenhower had the best chance of beating the Democrats. For this reason, Dewey himself declined the notion of a third run for president, even though he still had a large amount of support within the party. 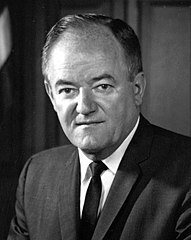 The GOP had been out of power for 20 years, and the sentiment that a proper two-party system needed to be reestablished was strong, also a Republican Party in control of the White House would have more incentive to reign in unpopular demagogues such as Wisconsin Senator Joseph McCarthy. The conservative Republicans, led by Taft, were based in the Midwest and parts of the South. The Midwest was a bastion of conservatism and isolationist sentiment, dislike of Europeans, in particular Great Britain, was common, and there was a widespread feeling that the British manipulated US foreign policy and were eager to kowtow to the Soviet Union, although attitudes were beginning to change among the younger generation who had fought in World War II. Taft had unsuccessfully sought the Republican nomination in the 1940 and 1948 presidential elections, losing both times to moderate candidates from New York (Wilkie and Dewey). Taft, 63, felt that this was his last chance to run for president and so his friends and supporters worked extra hard to ensure that he win the nomination. After being persuaded to run, Eisenhower scored a major victory in the New Hampshire primary, when his supporters wrote his name onto the ballot, giving him an upset victory over Taft. However, from there until the Republican Convention the primaries were divided fairly evenly between the two, and by the time the convention opened, the race for the nomination was still too close to call. 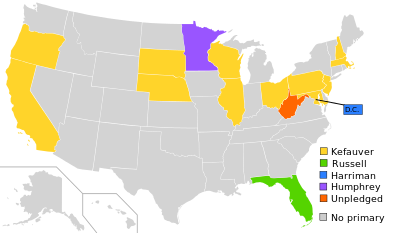 Taft won the Nebraska, Wisconsin, Illinois, and South Dakota primaries, while Eisenhower won the New Jersey, Pennsylvania, Massachusetts, and Oregon primaries. Stassen and Warren only won their home states of Minnesota and California respectively, which effectively ended their chances of earning the nomination. General Douglas MacArthur also got ten delegates from various states (mostly Oregon), but had made it clear from early in the race that he had no interest in being nominated. Eisenhower had apparently given little thought to choosing his running mate, when asked, he replied that he assumed the convention would pick someone. The spot ultimately fell to the young California Senator Richard Nixon, who was seen as being in the exact center of the GOP. Nixon was known as an aggressive campaigner and a fierce anti-communist, however he shied away from some of the more extreme ideas of the party's right wing, including isolationism and dismantling the New Deal. Most historians now believe that Eisenhower's nomination was primarily due to the feeling that he was a "sure winner" against the Democrats; most of the delegates were conservatives who would probably have supported Taft if they felt he could have won the general election. Truman's main opponent was populist Tennessee Senator Estes Kefauver, who had chaired a nationally televised investigation of organized crime in 1951 and was known as a crusader against crime and corruption. The Gallup poll of February 15 showed Truman's weakness: nationally Truman was the choice of only 36% of Democrats, compared with 21% for Kefauver. Among independent voters, however, Truman had only 18% while Kefauver led with 36%. In the New Hampshire primary, Kefauver upset Truman, winning 19,800 votes to Truman's 15,927 and capturing all eight delegates. Kefauver graciously said that he did not consider his victory "a repudiation of Administration policies, but a desire...for new ideas and personalities." Stung by this setback, Truman soon announced that he would not seek re-election (however, Truman insisted in his memoirs that he had decided not to run for reelection well before his defeat by Kefauver). After the delegates nominated Stevenson, the convention then turned to selecting a vice-presidential nominee. After narrowing it down to Senators John Sparkman, and A. S. Mike Monroney, President Truman and a small group of political insiders chose Sparkman, a conservative and segregationist from Alabama, for the nomination. The convention largely complied and nominated Sparkman as Stevenson's running mate. He was chosen because of his Southern identity and conservative record; party leaders hoped this factor would create a balanced ticket. Stevenson hoped to exploit the rift between the conservative Taft Republicans and the moderate Eisenhower Republicans. In a speech in Baltimore, Stevenson said, "The GOP elephant has two heads nowadays, and I can't tell from day to day who's driving the poor beast, Senator Taft or the General. I doubt that America will entrust its future, its hopes, to the master of a house divided against itself." Stevenson, Truman, and other Democrats campaigning that fall also criticized Senator Joseph McCarthy and other right-wing Republicans for what they believed were reckless and unwarranted attacks and congressional investigations into leading government officials and public servants. In a Salt Lake City speech Stevenson stated that right-wing Republicans were "quick with accusations, with defamatory hints and whispering campaigns when they see a chance to scare or silence those with whom they disagree. Rudely, carelessly, they invade the field of thought, of conscience, which belongs to God, and not to Senators...McCarthy and men like him can say almost anything, and if my opponent's conscience permits, he can try to help all of them get reelected." 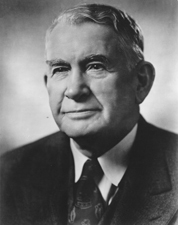 Stevenson said that right-wing attacks on government officials such as General George Marshall, who had served Truman as Secretary of State and Secretary of Defense, reflected a "middle of the gutter approach" to politics. President Truman repeatedly criticized Senator McCarthy's character and temperament, and called on Eisenhower to repudiate him. Stevenson ridiculed right-wing Republicans "who hunt Communists in the Bureau of Wildlife and Fisheries while hesitating to aid the gallant men and women who are resisting the real thing in the front lines of Europe and Asia...They are finally the men who seemingly believe that we can confound the Kremlin by frightening ourselves to death." In return, Senator McCarthy often jokingly confused the names Adlai and Alger, the first name of convicted Soviet spy Alger Hiss, by stating "Alger, I mean Adlai..." in his speeches. McCarthy, in response to Stevenson's criticisms, also stated during the campaign that he would like to get on the Stevenson campaign trail "with a club and make a good and loyal American" out of Stevenson. Despite these mishaps, Eisenhower retained his enormous personal popularity from his leading role in World War II, and huge crowds turned out to see him around the nation. His campaign slogan, "I Like Ike," was one of the most popular in American history. Stevenson attracted the support of the young, emergent postwar intellectual class, however Eisenhower was seen as more appealing to Main Street. Stevenson was ridiculed in some quarters as too effeminate to be president, the staunchly conservative New York Daily News called him "Adelaide" Stevenson, even though he had a reputation as a ladies' man and several mistresses. Eisenhower, who barely knew Nixon, waffled and refused to comment on the incident. 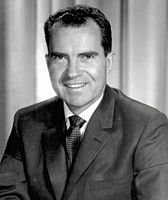 Nixon saved his political career, however, with a dramatic half-hour speech, the "Checkers speech," on live television. In this speech, Nixon denied the charges against him, gave a detailed account of his modest financial assets, and offered a glowing assessment of Eisenhower's candidacy. The highlight of the speech came when Nixon stated that a supporter had given his daughters a gift – a dog named "Checkers" – and that he would not return it, because his daughters loved it. The "Checkers speech" led hundreds of thousands of citizens nationwide to wire the Republican National Committee urging the Republican Party to keep Nixon on the ticket, and Eisenhower stayed with him. Despite the red-baiting of the right wing of the GOP, the campaign on the whole was conducted with a considerable degree of dignity and Stevenson was seen as reinvigorating a Democratic Party that had become exhausted after 20 years in power and refreshing its appeal with younger voters. He accused Eisenhower of silently tolerating Joseph McCarthy's excesses. Stevenson went before the American Legion, a bastion of hardline conservatism, and boldly declared that there was nothing patriotic or American about what Joseph McCarthy was doing. 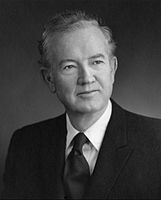 Even with the dignified nature of the campaign, the dislike between the two candidates was visible; Stevenson criticized Eisenhower's non-condemnation of McCarthy and use of television spots, and Eisenhower, while he had initially respected Stevenson, in time came to view him as simply another career politician, something he strongly disliked. 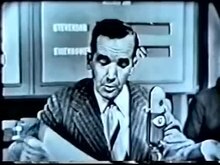 The 1952 election campaign was the first one to make use of the new medium of television, in part thanks to the efforts of Rosser Reeves, the head of the Ted Bates Agency, a leading advertising firm. Reeves had initially proposed a series of radio spots to Thomas Dewey in the 1948 campaign, but Dewey considered them undignified, and Reeves maintained that Dewey might have won the election had he been slightly more open-minded. Studying Douglas MacArthur's keynote speech at the Republican convention in July, Reeves believed that the general's words were "powerful", but "unfocused" and "all over the map". Eisenhower's public speeches were even worse, he was unable to make his point to the voting public in a clear, legible manner. Reeves felt that Eisenhower needed to condense his message down to a few simple, easily digestible slogans. Eisenhower at first also fared poorly on television and had a difficult time appearing relaxed and at ease on camera. The TV lighting was not flattering and it made him look old and unattractive, in particular his forehead tended to glisten under the lights. Eisenhower became upset when CBS correspondent Dave Schoenbrun pointed this out and suggested he try altering his poses to make his forehead less noticeable and also apply makeup so it would not shine from the lighting. Eventually, he gave in and agreed to these modifications. Reeves also wanted Eisenhower to not wear his eyeglasses on camera in order to look younger, but he could not read the prompter board without them, so Reeves devised a large, handwritten signboard. Reeves's TV work, although pioneering, was the subject of considerable criticism on the grounds that he was attempting to sell a presidential candidate to the public in the same manner that one might sell a car or a brand of toothpaste. Adlai Stevenson for his part would have nothing to do with television at all and condemned Eisenhower's use of the medium, calling it "selling the presidency like cereal". He himself made a point of the fact that he did not own a TV or watch television, and many of his inner circle did likewise. On election day, Eisenhower won a decisive victory, winning over 55% of the popular vote and carrying thirty-nine of the forty-eight states. Stevenson did not win a single state north of the Mason–Dixon line or west of Arkansas, whilst Eisenhower took three Southern states that the Republicans had won only once since Reconstruction: Virginia, Florida, and Texas. Despite the Republican win in Florida, this remains the last time to date a Democrat has won Collier County before southwestern Florida was turned into a growing Sun Belt Republican stronghold, and is also the last time a Democrat has won Aiken County, South Carolina, before the "Solid South" would collapse in the wake of the Civil Rights Movement. 1952 is also, however, the last time a Republican won Yolo County, California, or Native American Rolette County, North Dakota, and the last until Donald Trump in 2016 that the Republicans won Pacific County, Washington, or Swift County, Minnesota. 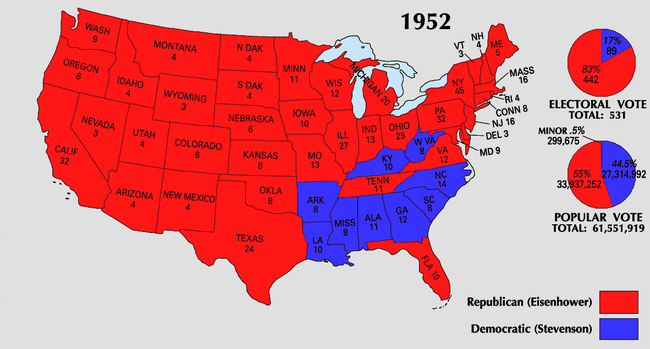 This was the last time the Republicans won Missouri until 1968 and the last time the Democrats won Kentucky until 1964. It is also the last time that a Republican won the election without Kentucky. Stevenson's 700-vote win was the smallest percentage margin in any state since Woodrow Wilson won New Hampshire by fifty-six votes in 1916. This election was the first in which a computer (the UNIVAC I) was used to predict the results. ^ Page, Susan (April 22, 2008). "Disapproval of Bush breaks record". USA Today. Retrieved April 23, 2008. ^ "1952: The Election of a Military Hero". The Press and the Presidency. Kennesaw State University, Department of Political Science & International Affairs. August 31, 2001. Archived from the original on April 20, 2009. Retrieved November 20, 2008. ^ Robert North Roberts; Scott John Hammond; Valerie A. Sulfaro (2012). Presidential Campaigns, Slogans, Issues, and Platforms. ABC-CLIO. p. 255. ISBN 9780313380921. ^ Smith, Peter H. (2007) . Talons of the Eagle: Dynamics of U.S. - Latin American Relations (2nd ed.). Oxford University Press, USA. p. 392. ^ Mason, Robert (2013). "Citizens for Eisenhower and the Republican Party, 1951–1965". The Historical Journal. 56 (2): 513–536. doi:10.1017/S0018246X12000593. ^ UNIVAC: the troubled life of America’s first computer arstechnica.com. Retrieved February 9, 2012. ^ "1952 Presidential General Election Data – National". Retrieved March 18, 2013. Davies, Gareth, and Julian E. Zelizer, eds. America at the Ballot Box: Elections and Political History (2015) pp. 167-83, role of television. This page was last edited on 6 April 2019, at 00:01 (UTC).